A beautiful small fascinator sitting on a sinemay base with a comb and elastic for easy wear. 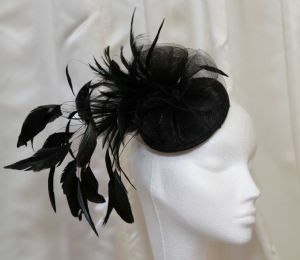 This gorgeous little fascinator is trimmed with crin and beautiful black feathers, making ir seem much more impressive for such a tiny piece. It would complement a race-day outfit and is oh-so-easy to wear.